The most diverse plant and animal life occurs along our shorelines — however, all of this is in danger. The trend is to remove the plants both in the water and on the land and separate these ecosystems with rocks, beaches or retaining walls. It is time to reverse this trend. The best first step is a site visit where we can look at the situation, listen to your concerns and goals and give you recommendations. Depending on your needs, we can help with the design, permitting process, and coach you through installation and maintenance of your project. Our goal is to have you be an active part of the process so you understand your own shoreline and can teach others. 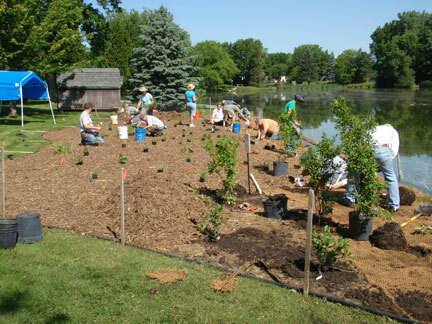 FCI can also work with you to conduct a workshop or series of workshops to teach you how to do your own shoreline plantings. Native plants established in the water and on the land! This creates a transitional zone that stabilizes soils, filters pollutants from surface water runoff and improves wildlife habitat.